Oh hello again. 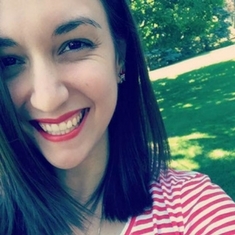 How have you been since my last post? I hope all is well in your little corner of the world! Well, Spring has most definitely sprung in my corner. The trees are so full of leaves, the flowers have bloomed, the cherry blossoms have come and gone, and the lilacs have bloomed! I love lilacs but lilacs don't love me. They are the prettiest purple flowers, with the most fragrant smell. Sadly, my allergies do not like them. Since I can't cut any lilacs off the bushes and put them in a little vase on my kitchen counter, I decided to paint the pretty flowers on my nails! I did them last year and was in love with the look. Instead of completely copying the manicure, I decided to do my lilac accents on all my nails. Let's take a look!! I wish the outdoor photos came out looking good, thank the Lord for lightboxes. Pretty, pretty lilacs. 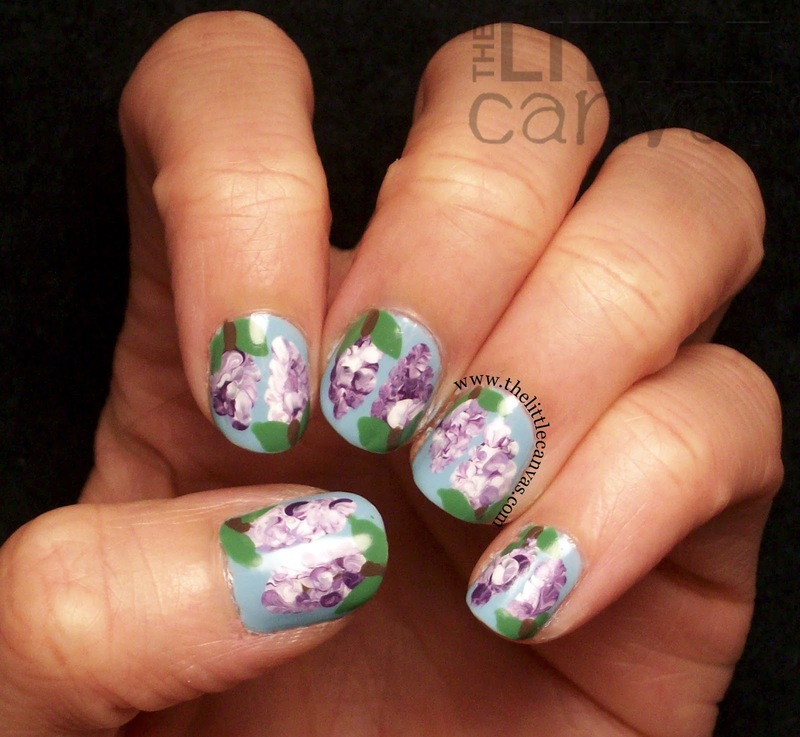 I loved this floral manicure so much. Sadly, I will not be posting a tutorial for them since they're near to impossible to re-create using a PhotoShop tutorial. Maybe I'll some day do a video tutorial or actual picture one if the mood strikes me. Since there will be no tutorial, I will still explain how I got the look. I first started off with a base coat of Sinful Colors - Sugar Rush. Such a pretty sky blue polish, which worked perfectly for the background of this manicure. Nothing is prettier than a picture of lilacs against a blue sky. I used two coats of the polish since one would have been too sheer. When my base was dried, with a nail art brush, I painted on two sticks using Sinful Colors Nirvana. These gave me an outline of where I was going to put the lilac on my nails and how I would "build them up" so to speak. Next came the marble lilacs. The marbilized polka dot is rather simple. On a paper plate, drip three colors (or more) which you want to marble together. I used Sinful Colors Amethyst, Snow Me White, and Candy Coated. Dip the end of your dotting tool into ALL of the polishes one at a time. This will gather each of the three polishes onto the dotting tool, and marble them together. You can dot a few times on the paper plate to see if the marbling worked. 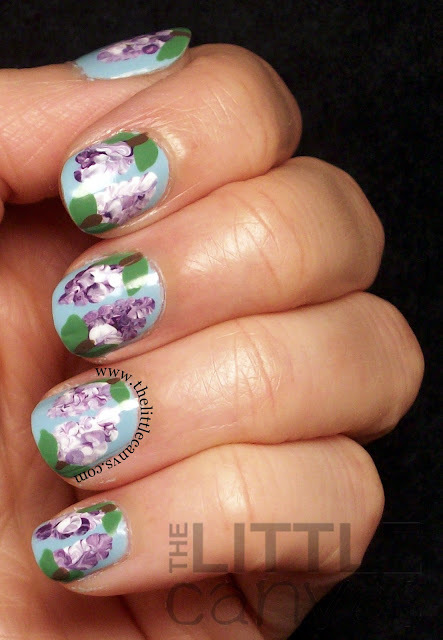 When I had the desired look, I dotted the flowers onto my nails. They all start to marble together when you are putting them in a close bunch like this, which really completes the look. When the flowers were dried, with my nail art brush, I went back through and added Zoya - Josie to create the lilac bush leaves. Josie is the perfect tree leaf green. 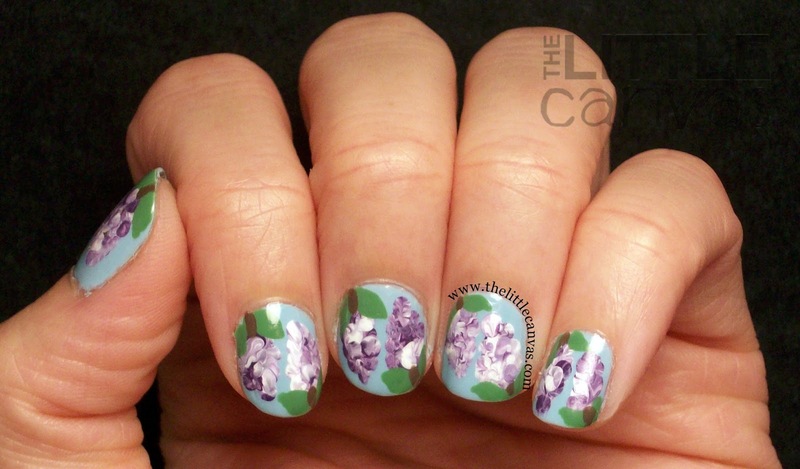 I debated on using Orly - Coachella Dweller as a base for the green leaf then outlining them with Josie, but I decided it would have been too busy and taken away from the pretty lilacs. What do you think? Loving the design? Better than last year? Ever tried the marbilized dot? Well, a lovely allergy migraine has set in, and I'm too lazy to read through this post to make sure there are no errors. If you have any questions about the technique or how I got the look, please do not hesitate to ask and I will try my best to clarify!! !